Thursday, November 1, 2018 - 8 p.m.
All shows are Sold Out except for October 31st. If you would like to attend a showing that has been sold out, please come 30 minutes before the showtime to see if anyone has cancelled their reservation and to put your name on the waitlist. 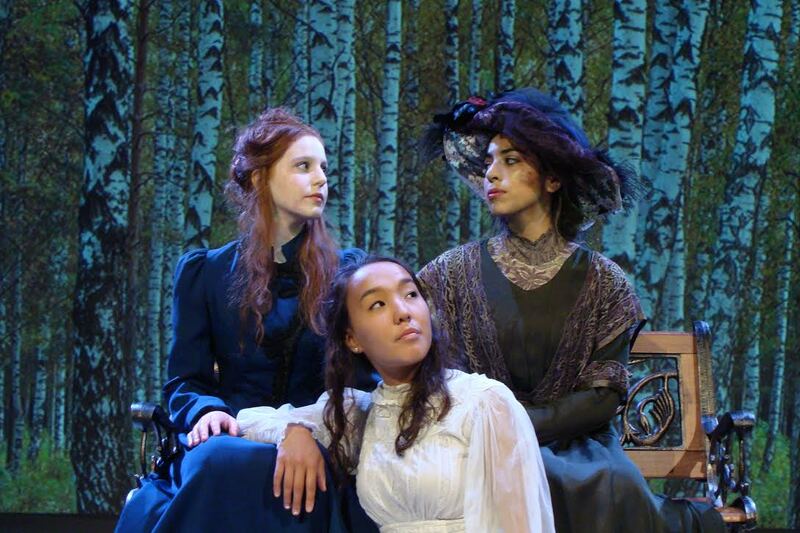 Our 2018-19 mainstage season opens with Three Sisters, by Anton Chekhov. At the dawn of the 20th century, three young women cope with life in a Russian backwater while dreaming of a return to Moscow. One of the great playwrights of the modern theatre weaves a story of love and loss, dreams and frustrations, and the many challenges we face in trying to understand "why we live, why we suffer." Director Frank Murray, in his farewell production at the College, plans to reconfigure the LeFevre stage to heighten the production's intimacy and impact. Only 125 seats available per show. Seminar 103 students request reservations through this Seminar link (link closed 10/24). The entrance to the theatre is closest to the gravel parking lot. Download map at bottom of page for directions. Due to the intimate nature of this performance, no late seating will be allowed. Please be sure to take your seat at least five minutes before the show starts. The show's runtime is three hours with a fifteen minute intermission between Acts II and III and a short stretch between Acts III and IV. We ask that you stay seated during the performance as the actors will be using the aisleways. $6, cash only. Tickets for this showing can only be purchased at the box office one half-hour before the show. THURSDAY, NOVEMBER 1st AT 8PM IS SOLD OUT! Friday, November 2nd at 5pm Is Sold OUT! Saturday, November 3rd at 2pm Is Sold Out! Saturday, November 3rd at 8pm Is Sold Out! Sunday, November 4th at 2pm is sold out! Wednesday, October 31, 2018 - 8 p.m.
Friday, November 2, 2018 - 5 p.m.
Saturday, November 3, 2018 - 2 p.m.
Saturday, November 3, 2018 - 8 p.m.
Sunday, November 4, 2018 - 2 p.m.
our popular 5 PM Friday matinee, which may be combined with a campus tour. View the Graphicanos exhibit before seeing the play. Light refreshments served. Celebrate the Arts at SMC, and toast to the success of the production on opening night. Saint Mary's College Museum of Art 6:00PM - 7:30PM. Distinguished poet Robert Hass (UC Berkeley) joins Three Sisters’ director Frank Murray in a conversation on Chekhov. Co-sponsored with Seminar Informal Curriculum. Hosted in Delphine Intercultural Center 4:00-4:45 pm.